eSports have been around for as long as the video game industry itself, and collectively refers to competitive video game play by professional and amateur gamers. As a long-time casual DotA / Dota 2 player this is a phenomenon I can relate to. However, it is only recently that the immense growth in audience and player engagement has moved eSports into mainstream culture as a legitimate professional sport with a massive global following. NewZoo estimates there are over 2.2bn active gamers globally. Currently, the eSports audience represents just 5% of that online gaming population, which suggests that there should be plenty more runway for eSport audience growth. That said, eSport viewers today constitute a respectable 167mn audience (79% of which are under 35 years old). With the younger demographics increasingly communicating via online channels — where social interactions take place — it is reasonable to expect eSport to be characterised by an interactive and social form of sports viewership that will continue to take share from traditional sports. The eSports audience is similar in size to the average of large professional sports leagues, and is expected to grow at a 14% CAGR over the next 5 years. SOURCE: Goldman Sachs Research. A number of factors are expected to drive continued audience growth, including growth in the global number of active gamers and the increasing size of prize pools in eSports. The latter in particular is picking up at a staggering pace and — I believe — is an important component to building interest among players and fans. Epic Games recently announced their plans to provide $100mn in prize pool money for Fortnite eSports competitions in the first year of game play — nearly matching the $113mn 2017 total eSports prize pool. It is reasonable to believe this will have a knock-on effect that will drive more players and viewers into not only Fortnite, but all types of games. Dota 2 currently has the largest prize pool of all eSports titles. That will change with Tencent/Epic Games’ $100mn Fortnite contribution starting in 2019. Total eSports prize pool is expected to grow at a 30% CAGR over the next 5 years. SOURCE: Goldman Sachs Research, NewZoo. Despite its large and fast-growing audience, eSport is significantly under-indexing on monetization relative to established sports leagues. In fact, eSport has a 14x (9x) lower revenue:viewer ratio than the NFL (NBA). One key reason is that eSports is not a “league” comparable to the NFL or NBA. It is a global ensemble of audiences from hundreds of video game IPs. While a traditional sports league like the NFL can collectively bargain for media rights on behalf of its various teams, eSports as an entity cannot do the same for all of its IP. Another reason is the global geographical spread of the eSport audience. While leagues like the NHL or MLB, with audiences largely concentrated to the US markets, have done a great job at monetizing their local revenue streams (ticketing, concessions, merchandise, etc. ), regional eSports tournaments have struggled to make significant profit on their local revenue (typically ticket sales and concessions have gone to paying third-party event organisers and building the prize pool for the players). eSports dramatically under-index on monetization relative to established sports leagues. eSports currently monetize at an average annual $3.9/viewer, whereas the NFL (NBA) monetizes at $53.8/viewer ($34.8/viewer). SOURCE: Goldman Sachs Research. leaving 17% to other revenue sources (including other local revenue sources). leaving 11% remaining for the rest. With this distribution, NewZoo expects total eSports revenue to reach $3bn by 2022. 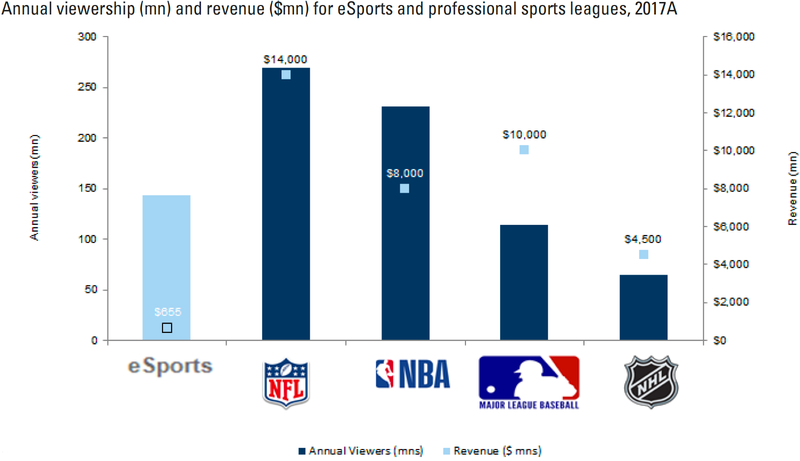 That would reduce the monetization gap vs regular sports leagues, putting the NFL (NBA) at 5x (3x) eSport’s revenue:viewer ratio — down from 14x (9x). NOTE: These numbers are excluding revenue from online gambling and betting related to eSports (e.g., via BWIN, Unikrn), an economy that exists in parallel to eSports and, similar to sports, generates more revenue than eSports itself. By 2020, total eSports betting wagered amount could exceed $23bn. eSports revenue is expected to grow at a 35% CAGR over the next 5 years, reaching $3bn in 2022 with Media Rights as the largest revenue component. SOURCE: Goldman Sachs Research, NewZoo. The exact path to the numbers above is not figured out, and many businesses will expectedly be built as a contribution to that destination and what lies beyond. Here are 8 interesting areas where those contributions can be expected to take place. 📺 Online Video. Companies focused on distributing/broadcasting eSports-related content. An obvious player here would be Twitch, but other notable examples are Asia-based streaming platforms Douyu and Huya (have received $1.1bn in combined venture funding) as well as US-based Caffeine (ex-Apple team backed by a16z, Greylock and 21st Century Fox). In all, this category has received 61% of 2013–2018 eSport VC funding, or $2bn. 🏆 Events & Tournaments. Companies focused on managing eSports events and hosting eSports tournaments. Our own investment RFRSH Entertainment falls into this category, with their mission to build a best-in-class CS:GO media experience through their Blast PRO tournament series and associated community communication. 🎥 Media production. Companies producing original eSports content. This category partly overlaps with the one above, but it goes beyond hosting tournaments. RFRSH Entertainment falls into this category as well, with their Blast PRO Originals documentary-style video series and more. Another example is DBLTAP, who take a “behind-the-scenes” approach to content creation in association with tournaments and events (parent company MinuteMedia raised $17mn in May 2018 from Goldman Sachs and others). 💻 Software tools. Companies focused on building software tools for content creators and users. A prime example is Discord, an app designed specifically for gamers with voice, video, and text features, that facilitates communication during multi-player gameplay (raised $50mn Series F in April 2018 from Tencent). 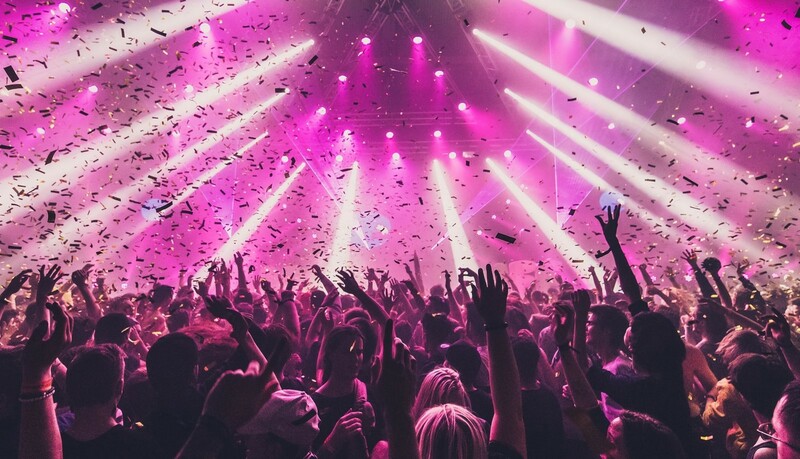 US-based FanAI is building an artificial intelligence platform to help leagues and teams better monetize eSports fans (raised $2.5mn in Seed funding in 2018). A different example from Asia is Wangjing Tech, who operate a website for internet cafe payments and eSport tournament registrations (raised $31mn in February 2018 from Chinese investors). 📣 Communication, Social & News. Companies focused on the open flow of information within the eSport community. The collaborative Wikipedia-inspired platform FANDOM is an example of such a social platform (raised $106mn in February 2018 from Amazon and others). esportpedia by Esports One is another example (raised $3mn in January 2018). 🎮 Hardware. Companies focused on building innovative hardware for eSport. For example, Scuf Gaming builds high-performance 3rd party gaming controllers that are today used by many pro console gamers. Another example is Secretlab, who build gaming chairs that are highly popular among professional and casual eSport players. ⚜️ Teams. This category has received an increasing amount of funding in recent years. For instance, CS:GO and Call of Duty team EnVyUs raised $35mn in 2018. Players in this space will typically look to manage their teams’ sponsorship deals, tournament participation rights and other revenue streams. An EU LCS slot (i.e. a right to participate in the main League of Legends championships) will today set a team back $13,000,000. 🌐 eSport infrastructure and rewards-gaming. Companies developing infrastructure and interfaces for eSports on top of existing IP. For example, Swedish-based G:loot facilitates cash-based gaming competitions on mobile, tablet, and PC (raised $12mn in late 2017). Another Swedish company, Challengermode, is building a scalable platform for an amateur league infrastructure (similar to the amateur sub-leagues in traditional sports) that aims to fill the gap between casual and professional eSports gaming (raised $3.8mn in May 2018). If you have any thoughts or feedback, or if you are building a company that is somehow addressing the monetization gap in e-sports I’d love to hear from you. Feel free to reach out to me by email on philippe@heartcore.com or on Twitter @philippekc .